As an essential trace mineral, Zinc is second to Iron as the most plentiful trace element in the body. It is needed for a number of enzymatic functions in the body, as well as for immune function, prostate health, antioxidant production and more. 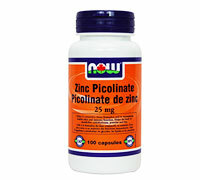 Now's 25mg Zinc formula uses a unique picolinate form, which is believed by many health professionals to be better absorbed and utilized by the human body. Picolinate form for better absorption. One of the first signs of zinc deficiency can be altered taste and smell.Â Zinc regulates the activity of insulin, for blood sugar control, thyroid hormone, for metabolism and the digestion of sugar and protein.Â Natural health practitioners use zinc for a variety of health concerns including; acne, benign prostatic hyperplasia, colds, flus, diabetes, diaper rash, stomach ulcers, macular degeneration, impotence, osteoporosis, eczema and wound healing. Zinc levels are decreased by diarrhea, kidney disease, liver disease, alcoholism and diabetes.Â Zinc is not absorbed when it is consumed with fibre, phytates (found in grains and legumes), hard water, calcium, copper and iron.Â Zinc is lost through perspiration so supplementation may be helpful for athletes, those who live in hot climates and those who regularly use saunas or steam rooms.Â Zinc is depleted by the following medications: oral contraceptives, some diuretics, ulcer medications, antiviral medication and some antibiotics.Â Much of our food is deficient in zinc due to poor soil levels of the mineral.Â Food processing techniques destroy zinc.